PHUKET: Despite having already seen its fair share of on-field action in the ongoing Island Furniture League, the Alan Cooke Ground (ACG) celebrated its official opening last weekend. Martin Foster drives during Sunday’s match between the Cricket Association of Thailand and Asian Cricket Council. 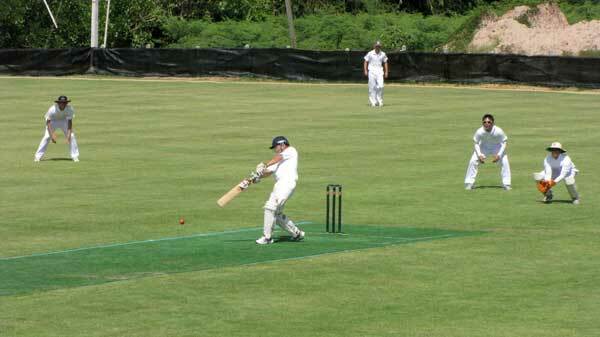 The marquee event was on Sunday when a CAT (Cricket Association of Thailand) representative side took on an ACC (Asian Cricket Council) team, which included a former international Test captain, in a 40 over match. CAT XI won the toss and decided to field, an unexpected decision given the searing midday heat. And it looked as though the move may have been the wrong one as the ACC openers went about establishing a solid opening partnership, moving to 31 off six overs until paceman Kitanu struck, cleaning up the stumps of Val Guiraud (6). But when Martin Foster fell just two overs later, ACC were left in a potentially precarious position at 2-36. Bill Stahmer was then joined at the crease by former Bangladesh Test captain Aminul Islam, who combined for a solid partnership of 68 runs to steady the ACC innings. The two looked determined, with Stahmer even pulling off an athletic dive straight through the stumps to avoid a runout. After Stahmer was trapped lbw for 18, his son Matt walked out to the middle, blasting 41 off 52 balls to help lift the ailing run rate. CAT could have lessened the damage, but dropped him on 16 and again on 21. Islam retired not out on 52 from his 68 balls, which included some sensational cover drives to the boundary. With the score on 135, the ACC tail were able to push the score along to a respectable total of 196, aided by the 42 extras gifted to them by the CAT bowlers. Pick of the bowlers was G Pearawat with 3-50 off his eight overs. After the innings change, CAT went about their business well, with the openers reaching 27 from eight overs before losing Saurab for 15 off the bowling of Culpan. ACC rallied and continued to stick to their line and length, putting CAT on the ropes at 6-96. But some brilliant batting from number four batsman T Wanchana (65 not out) saw CAT get home by three wickets with just three balls to spare. Saturday also saw a match between two local sides – PCG A and PCG B – in an exhibition T20 game. PCG B won the toss and elected to bat, surviving their overs to finish with a respectable 6-135. Seemant Raju top scored with 23 off 28 deliveries before he was caught off the bowling of Ryan Dunn. Contributions were also made by Dean Noble (16), Ian Lenton (14) and Anil Rawat (14 not out). They were also aided by some loose bowling from PCG A, who let through 36 extras. Pick of the bowlers was Sameer Khan who picked up 2-19 off his four overs. PCG A started off their chase in the worst possible way, losing two wickets of the first two balls of their innings. It was then up to Ryan Dunn, who has been the standout player in the current Island Furniture League season, to steady the innings. He and Sameer Khan combined to put on an impressive 85 run partnership to send PCG A over the line with 2.3 overs to spare. Pick of the PCG B bowlers was K Jhagta with 2-19 off four. The ACG will return to hosting Island Furniture League matches this weekend when Liquid Lounge Lizards take on young guns the Phuket Leopards.